In the late Middle Ages, the English civil service was a fertile breeding ground for poetic talent. John Gower had ‘worn the rayed sleeve’ of a court official. Thomas Clanvowe was a knight of the royal household. Thomas Hoccleve was a clerk in the privy seal office. 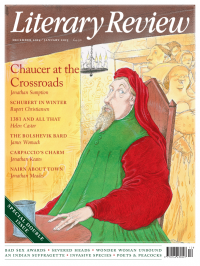 We know more about the life of Geoffrey Chaucer than that of any other medieval poet. But we would know almost nothing if he had not been a civil servant, by turns courtier, soldier, diplomat, customs officer and member of Parliament. He lived for much of his life in London in rooms over Aldgate, during one of the most raucous periods of the city’s history. He travelled on the king’s business in France, the Low Countries, Italy and Spain. He read in several foreign languages. In an age when even the great men of the world lived shuttered lives with narrow horizons, Chaucer’s rich variety of experience stood out. Medieval biographies are problematical. The early years are rarely recorded, even in the case of kings. Private life is impossible to penetrate. Conventional praise obscures the character of heroes. The lives of writers present special difficulties. They left hardly any personal papers before the 17th century. Documentary sources tend to be spare and episodic. Squeezing autobiographical material from poetry and fiction is a famously speculative and unreliable business. Chaucer, it is true, should make an easier subject than most. Nearly five hundred contemporary records are printed in Chaucer Life-Records, the Chaucerian scholar’s bible, published in 1966. But they are highly impersonal documents – account entries, leases, safe-conducts and the like – which provide no more than the bones of his public career. You could read them all without knowing that the man had ever been a writer. And as for the writings themselves, Chaucer was spare with personal confidences and gave little away. Perhaps wisely, Paul Strohm’s The Poet’s Tale avoids the conventional opening and closing scenes. He starts in the middle, in the ‘year that made the Canterbury Tales’. We are in 1386, when Chaucer was in his early forties. Strohm regards this moment as the turning point in the poet’s life. What went before is seen cinematically, in flashbacks. What came afterwards is seen through the experiences of a shattering year. To understand why, one needs to penetrate a society in which patronage and clientage were the keys to worldly success. Chaucer was a successful man, but humbly born. His father had been a middling wine wholesaler in London, not exactly a nobody but hardly a great figure either. The poet put his foot on the bottom rung of the ladder of preferment at the age of about fourteen, when he found a place as a page in the household of the Countess of Ulster. But his first real opening came after the countess’s death with his marriage to Philippa Roet, the daughter of one of the king’s Hainault knights. Chaucer was fortunate in his sister-in-law. Katherine Roet had married an English knight, Sir Hugh Swynford, and, after his death (or perhaps before), became the mistress of John of Gaunt, Duke of Lancaster, the most powerful and politically active of Edward III’s sons. The house of Lancaster was the great engine of patronage in late 14th-century England, the centre of an ‘affinity’, devoted to the promotion of its members, which extended through every department of government and most of provincial England. It was through his wife’s Lancastrian connections that Chaucer obtained regular employment as a diplomat and later a lucrative office in the London customs house. All of this fell apart in 1386. John of Gaunt was far away, trying to conquer a kingdom for himself in Castile. The poet’s marriage, which had been the foundation of his career, was drawing to a close. The couple had not lived together since about 1372, when Philippa had joined the household of Gaunt’s Castilian duchess, Constanza. Philippa outranked him socially and inhabited a different world. When Constanza left for Castile with her husband, Philippa retired to Lincoln Cathedral close, where she died the following year. Her government annuity, which had been regularly collected by her husband, came to an end. At Westminster, power was draining away from the court into the hands of an aristocratic opposition led by Gaunt’s younger brother Thomas of Woodstock, Duke of Gloucester. Chaucer had nothing to hope for from that quarter. He had been closely associated with a faction in London that had supported Richard II’s ministers. He was elected to Parliament in 1386, but the Lancastrian group to whom he owed his election was quickly marginalised, and he was compelled to watch as his friends were swept from power during the parliamentary revolution that followed. Strohm traces Chaucer’s well-known cynicism about marriage to these years, and claims to detect the experience of the Parliament of 1386 in the unflattering treatment of political assemblies in his later work. This may be reading too much into the sources. Both were established themes of contemporary satire and Chaucer had been cynical about political assemblies for years. But Strohm makes a strong case for regarding 1386 as a personal turning point for the poet. He withdrew from the city where he had passed most of his life. He gave up his position in the London customs house. He surrendered his rooms above Aldgate and retired to Kent, where he appears to have had no property and very little income. Strohm is surely right to identify the political upheavals in London and Westminster as the root of these sudden changes. Chaucer would not be employed by the crown again until Richard II recovered control of his government and John of Gaunt returned to England in 1389. It was in the midst of these upheavals that Chaucer began work on Troilus and Criseide and Legend of Good Women. Strohm speculates that he may also have embarked on his masterpiece, the Canterbury Tales, at this time, though the poet had been collecting material for an English Decameron for some years and probably did not put pen to paper until the 1390s. What is clear is that these three works, the longest that survive from his pen, were quite unlike anything he had written before. Chaucer himself was well aware of this. When he died in 1400, the Canterbury Tales was unfinished. This was probably deliberate. In the form in which he left it, the final piece was the ‘Parson’s Tale’, which is not so much a tale as a prolonged reflection on sin and penitence, concluding with the author’s ‘Retractions’, written when he was dying. Here he listed the works that he wished he had never written. They included everything that he had composed since 1386, among them the Canterbury Tales (‘thilke that sounen unto sinne’), together with ‘many a song and many a leccherous lay’. Only his translations of Boethius and the devotional works were saved from this virtual book-burning. The late Middle Ages, with their ingrained pessimism and profound sense of personal corruption, were always ambivalent about secular literature, and Chaucer, facing death, came to share that ambivalence. The Canterbury Tales, it is true, is full of sin and lechery. But there is more to these stories than that. In them, and above all in the ‘General Prologue’, Chaucer escaped the formulaic quality of so much contemporary writing, revealing a power of social observation that is unique in his time and rare at any time. He is the earliest writer in English to make one laugh out loud. What had brought about this transformation? So far as any biography can answer that question, this one does.